Earle A. Nollinger, 90, of Warren, PA, died Thursday morning, October 27, 2011 at St. Vincent Hospital in Erie, PA following an extended illness. Born February 1, 1921 in Warren to the late Frank A. and Mabel Nollinger, he spent his entire life in the local area. A 1940 graduate of Warren High School, Earle proudly served more than three years in the U.S. Army during W.W.II., where he achieved the rank of Corporal. Following his service during the war, he worked for Deluxe Metal Fabrication, C.C. Smith Buick/GMC dealership and Dan Dodge/Chevrolet dealership as a mechanic, and 23 years as a letter carrier for the U.S. Postal Service before retiring. 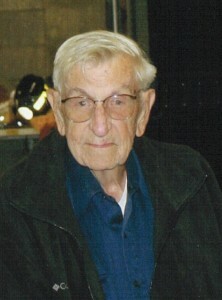 Earle was a member of the Clarendon Fire Department for 62 years, Warren County Fire Coordinator for 19 years, and Warren Eagles Lodge #313. He was an original member of the Warren County Fire School. He enjoyed roller-skating, deer hunting and bowling for leisure. He is survived by his wife of 68 years, Helen E. Richeal Nollinger, whom he married on April 23, 1943 in Warren; Five children- Dean Nollinger of Dayton, OH, Dianne Doon and her husband, Michael of Dade City, FL, David Nollinger of Johnstown, PA, Dennis Nollinger and his wife, Marcella of Scandia, PA, and Dudley Nollinger and his wife, Cindy of Warren; Eight grandchildren, a step grandson and several great grandchildren. In addition to his parents, he was preceded in death by a grandson, James N. “Jimmy” Nollinger, a brother, Ernest Nollinger; and three sisters, Garnett Stover, Doris Jones and Mabel Oviatt. Funeral services are private and at the convenience of the family. Memorial contributions may be directed to the Clarendon Volunteer Fire Department, 17 N. Main St., Clarendon, PA, 16313. The Donald E. Lewis Funeral Home, Inc. is entrusted with arrangements. Online condolences may be offered at www.lewisfuneralhomeinc.com. My sympathy for your loss, you are in my thoughts and prayers. We send our condolences and heartfelt prayers for your loss. Earle’s wisdom will be missed at the fire station. Nollinger Family: We are so sorry for your loss. You are in our thoughts and Prayers!